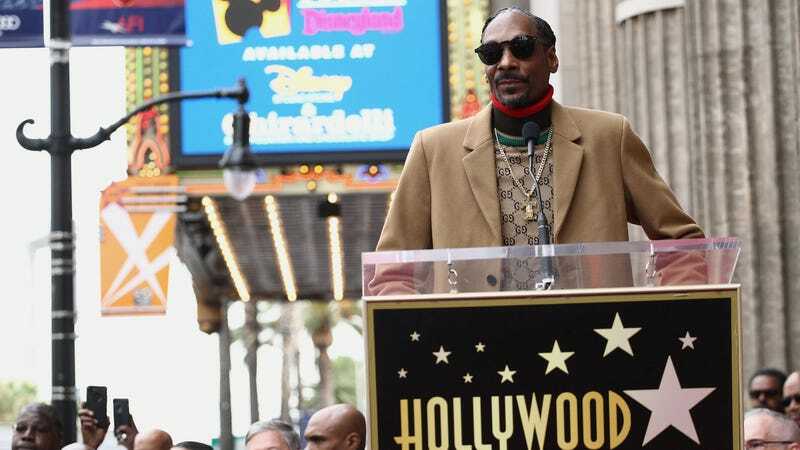 Rapper/singer-songwriter/record producer/television personality/entrepreneur/football coach/Martha Stewart BFF/actor Snoop Dogg received a star on the Hollywood Walk of Fame outside the El Capitan theater on November 19. His is the 2,651st tribute to celebrity on the sidewalks of Los Angeles, and during his speech, the Doggfather wanted to thank the man responsible for all of his success: Tha Snoop D-o-double g.
Snoop has definitely earned some tangible appreciation for his career, selling over 23.5 million albums in the United States and 37 million albums worldwide. And since he seems to be the Susan Lucci of the Grammys with 17 nominations, an zero wins, the Walk of Fame is a big deal. So when it came time for Snoop to recognize the person whose hard work and tenacity paved the way for the honor, naturally, the artist formerly known as Snoop Doggy Dogg and Snoop Lion gave thanks to the most important member of his squad: himself. Snoop’s been having a good year: His most recent album, Snoop Dogg Presents Bible Of Love, topped the gospel charts in March, and Redemption Of A Dogg, the semi-autobiographical musical that he’s starring in, has just finished up its autumn tour. His new cookbook (From Crook To Cook: Platinum Recipes From Tha Boss Dogg’s Kitchen) is available wherever books are sold, his GGN news show is coming soon in adapted form to film and television, and his game show (Snoop Dogg Presents The Joker’s Wild,) is returning to TBS next year. And, if that wasn’t enough, earlier this year Snoop Dogg set the Guinness World Record for the largest Paradise cocktail: a “Gin and Juice” drink measuring over 132 gallons and containing 180 bottles of gin, 154 bottles of apricot brandy and 38 jugs of orange juice. Laid back. The fact that Snoop is indeed a hard working man/bad MFer isn’t the only reason he has to shout himself out. While it’s true that anyone can nominate a celebrity for inclusion—including fans, the public figure’s manager, agent, studio, network, or the celebrity themselves, there is a stipulation that whoever does the nominating also agrees to be responsible for paying the $40,000 it costs to install and maintain the star. That’s why it makes sense for talent (or their family or studio) to nominate themselves —$40k is a lot of money, even if you have eleventy billion income generating projects like Snoop does.